A Princess was born to be Queen, as are so many others. Her life in the beginning was a state of confusion as nothing seemed right, seemed to fit, and everything she thought, turned out to be 'wrong'....at least in this world. Things happened in the course of her life that did not honor who she knew she was, and it brought further confusion as to why others did not know she was, in point of fact, a Princess! Her mother looked at her and knew something was, erhm....different, and would often, albeit simultaneously annoyed as desperate, ask ''where do you come from?! ''.....a veritable humorous question coming from ones own mom to her own flesh and blood child, but a sincere question none the less. This Princess, saw her moment of recognition in these strange questions and thought for a moment that life would now finally! become ''normal''......but it never did. The question died unanswered in the quantum space of mystery. As she grew, she decided to recognize Her Self within Herself, secretly. This seemed to work fine, but produced an air of mystery that further invited questions which rather than become more intelligent as befits adulthood populations, in fact became more primitive. This sparked an increasing lack of interest in said population by Princess, understandably. So, Princess's secret was kept to her self, except for the very few who had The Sight. Once in a while one came along who could see her, beyond her face and body, into her Spirit and Soul, and who knew Her. This was one who gained the love of this Princess in no time. However, in the spirit of the obligatory tragedy ubiquitous in Fairy Tales, it turns out that just because one could see the Royal Secret of this Princess, didn't mean they had integrity and honor of Spirit , no. It just turns out they had a gift of seeing.....limited seeing. To Princess, this gift of seeing was synonymous with many virtues, but in THIS world, it didn't work that way. She loved too often, those who lacked virtue, and the ''sight'' they possessed was shallow indeed. A long life lived having spent far too much time in a patriarchal world, this Princess never the less, succeeded in maintaining her secret, Royal as it was, to herself and lived happily with it fully in tact. She did work, and do all the things others did, but eventually quit them all seeing those matrix activities for what they were. In our time, she lives still, quietly, in a Secret Garden only she knows about, along with her roommate who also happens to be in the know about her Royal Secret, for he saw it upon the instant and declared his knowledge of her right away. Her delight knew no bounds again, but again, to no avail, for his sight was limited to his own personality and quirks, and he ''saw'' only when it was convenient or he was in the mood. Such is the nature of this population. Princess found that in THIS world quite unlike her beloved Fairy Tales of renown, it is reversed in so many ways, that when you kiss the prince he turns into a toad. However, Mystery would have it, that he would not soon forget her Royal Secret much as he would like to, as long as she lived in his house for there were many a time, when the powers of her magic defied his preference to ignorance, and showed themselves to him, to his great chagrin. And even over the course of the years, as these displays grew in number and curiosity, he never developed a sense of curiosity himself. Yet he, by divine decree was not allowed to forget it. Including the now infamous incident with toads....I kid you not. So he remained with his respectful distance to this Princess, and though not displaying an appropriate appreciation for this Royal Secret, was not stupid enough to falter into total forgetfulness. For all she had to do was speak in a tone, or look him straight in the eye, and he quickly remembered just who was speaking then, and should she be too weary for the sometimes necessary 'tone' and 'eye', then events themselves would step in and be sufficient reminder. It was almost as if, the Mysterious World she occupied was looking out for her in this one. And at least over the years, to his credit, when he was in the mood, he would upon the rare occasion of socializing with one of her guests, remark on some of her magical abilities, showing he did in fact remember. So, as this Princess lives secretly in the Secret Garden, in a secret city, with her Royal Secret, she becomes a Queen by virtue of her years and wisdom. She remains anonymous to the world, but not to the Mysterious World with whom she has a greater relationship. Yet in this world, she must exist and do as others do. One of those things is to engage in Fairy Tales, to which she is greatly, enormously, and devotedly in love with. And despite the fact that all Fairy Tales of old were written by men of those times who imagined stories with the mechanics of their own deficient male minds, completely lacking an understanding of the virtues of women, adding to their desperate lack of ingenuity and beauty potential in storytelling, Princess still enjoyed the magical aspects and happy endings of them all. One of her favorites as it is to many a Princess, is Cinderella. What woman doesn't feel she is working too hard? with too little recognition or abuse? no appreciation and love? Most of us do, and this Princess is no exception. In fact, when she is feeling a bit too alone, she will put the movie into a box, pick up a remote device, and magically watch the movie anticipating the well known ending with the same sentiment, the same emotions, the same feelings, as all the other times before. She watches it for the end....for the happiness she prays will be her end too.....for her Prince, and for the love and recognition he has for her Spirit and Soul. 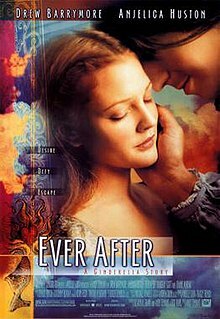 The version Princess watches most is "Ever After" with Drew Barrymore as the Cinder girl. It is this version that tears up her eyes for so many reasons. Granted, our Princess had no such evil women in her Life, this is in fact, the perception of the Brothers Grimm....(Note their name ''grimm'')......who wrote that story amongst many other gory children's stories, but still it remains popular. And Princess relates to all else about the story, but mostly because the end is her hearts living prayer. In this movie there is the beauty of the transformation she receives by her helpers, those who truly love her for who she is, and who will always love her no matter what happens in her life. In this transformation, she gets to know beautiful quality garments from her beloved mother, that instantly transform her into the vision of who she is on the inside, on the outside.....so that all can now see. 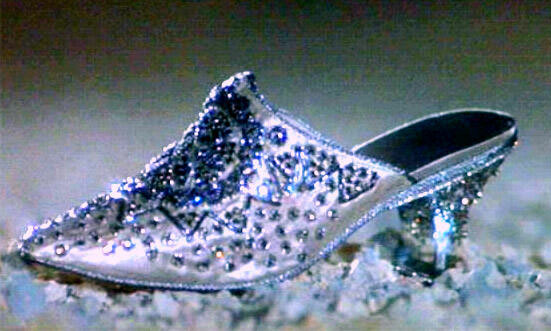 In this version of the story, there is the Slipper.....the ever so famous Slipper that she leaves behind, as those she loved forsake her and she goes off running away from the pain of it. 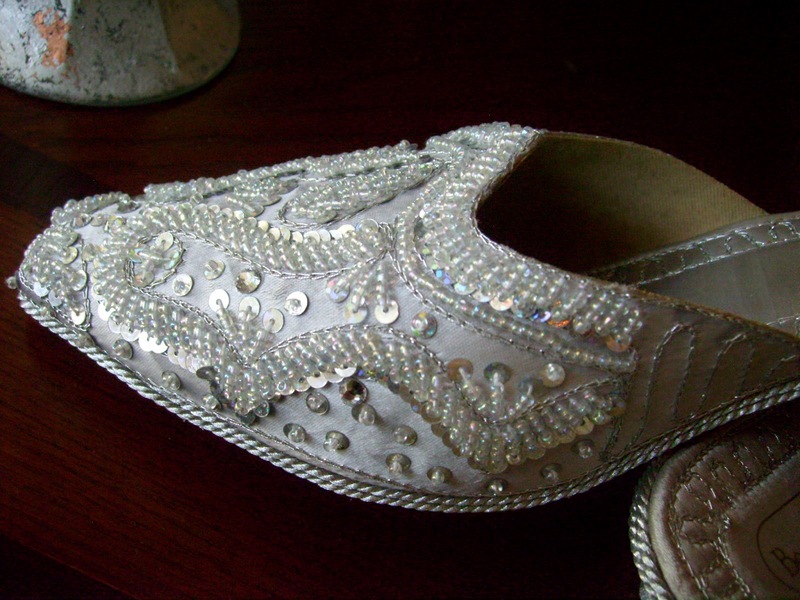 That Slipper in the movie was one of the most beauteous shoes this Princess ever saw.... one she thought she might even like to wear herself. Well, in Our Times, many things can happen if one wishes hard enough, and soon, this Princess, sentimental one more time from her happy ending prayer, goes to the box known as 'personal computer' to see if she can find something like it, something close enough, that she could possess her self, to remind her in even more concrete ways, that Fairy Tales can, and do come true. She thought that if she could find a Slipper like the beautiful sparkly one the Cinder Girl wore, that she too could wear it, and feel transformed, and that others would finally be able to see her sparkle on the outside, like she does on the inside. She found the slipper shoe. Times being tough for this broken hearted Cinder Princess in our own times, she has to put off such a luxury, not because they were expensive because they certainly are affordable....but the expense was in changing the happy ending prayer.....she didn't want to change it from the Prince finding her and recognizing her for who she was. If this Princess bought the shoes her self, there is no Prince, and this might cost her the luxury of dreaming a happy ending, WITH A PRINCE. She put off buying them. Her heart could not afford another break. The Cinder girls' story lives on in her heart, and as our Princess works hard, even cleaning out fireplaces getting covered with real soot, still.....she so longs to find a slipper on her own feet, and her own ''happy ever after''. She finds the slippers again on her personal computer, and again she looks, dreams, longs, and waits. One day, she decides to get them, to wear them, and that she'd change the ending to her own story to something more suitable to her own life, but she couldn't figure it out yet. 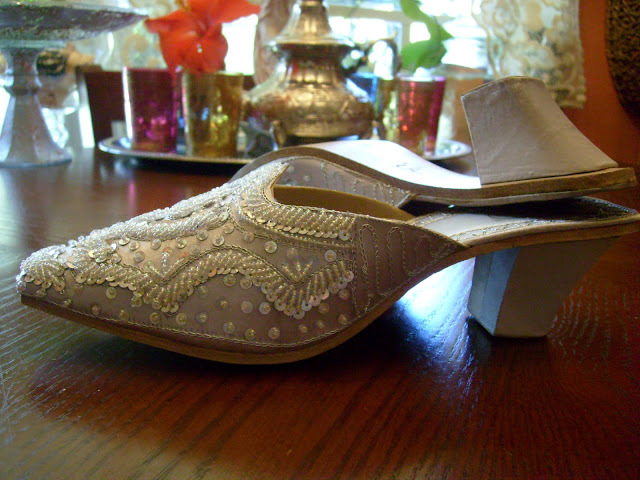 However, the decision to get the beautiful slippers she found, was fixed. Turns out, as she was working especially hard one day gardening and weeding, and planting vegetables in her secret gardens, the roommate said to her ''get the shoes''.......in other words, he was gifting them to her. 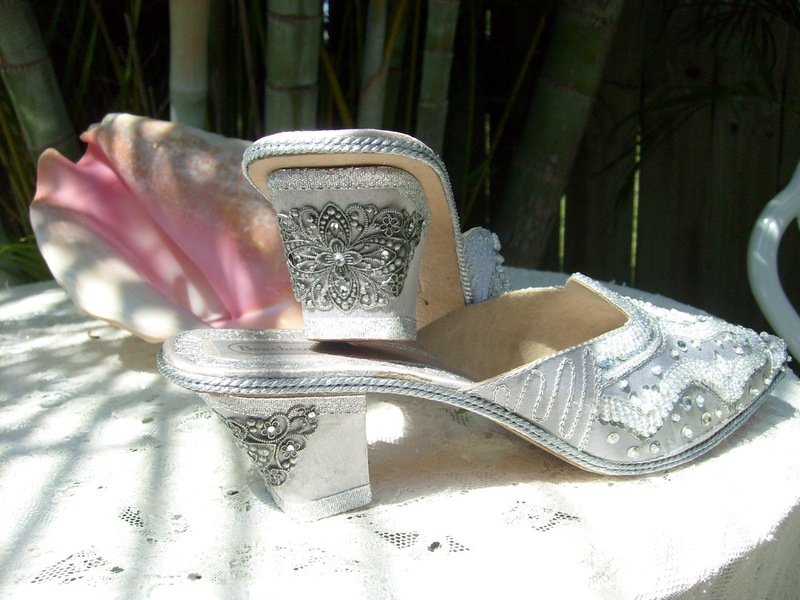 Princess had told him about her finding the slippers, and the beauty she longed to possess. She said ''really ????" he said 'yes, I'll get them for you'......''well thank you, Sir! but why would you do that?'' she asks. He said: ''Because you deserve them''. She found this relieving and mentioned that she knew she ''deserved'' them, :D .....she knows her value and worth and all she does, but for HIM to see it, was the amazing thing. Not to let a good moment pass for too long, she ordered them on the spot. 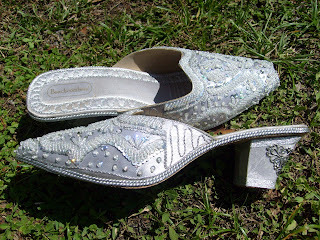 These particular shoes from this company though very close to the slipper of her dreams, and indeed even designed after the original slipper of the original Cinder girl, while very pretty, needed some work for she was not going to be outdone by any high end designers of ancient crafts or artisans from Florence, Italy or anywhere. No......she was going to have the same quality, for it was quality that made them so special. 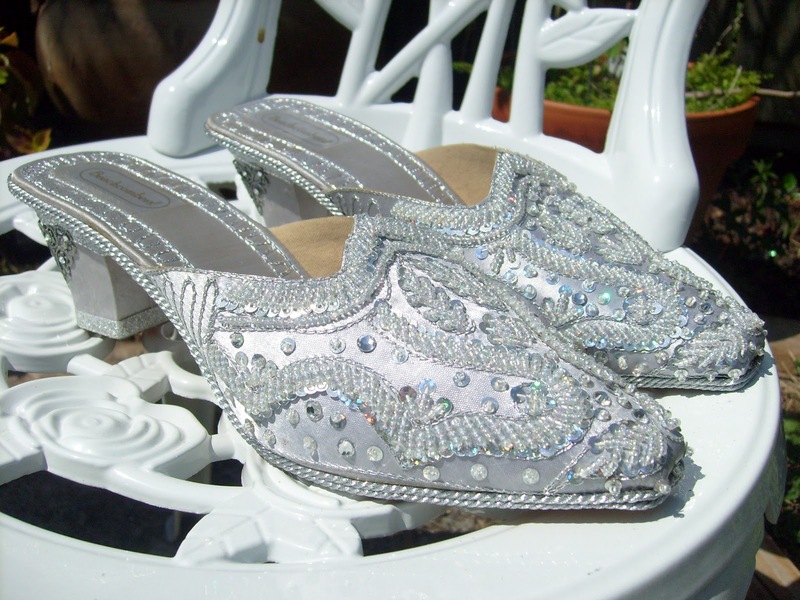 They needed some more artwork and Swarovski crystals, just like the original ones, to bring them into the ''wow'' effect this Princess wanted and these slippers from this company were well made and an excellent foundation to work upon. She looked at the shoe and knew what to do. She planned, she shopped, she went to work. 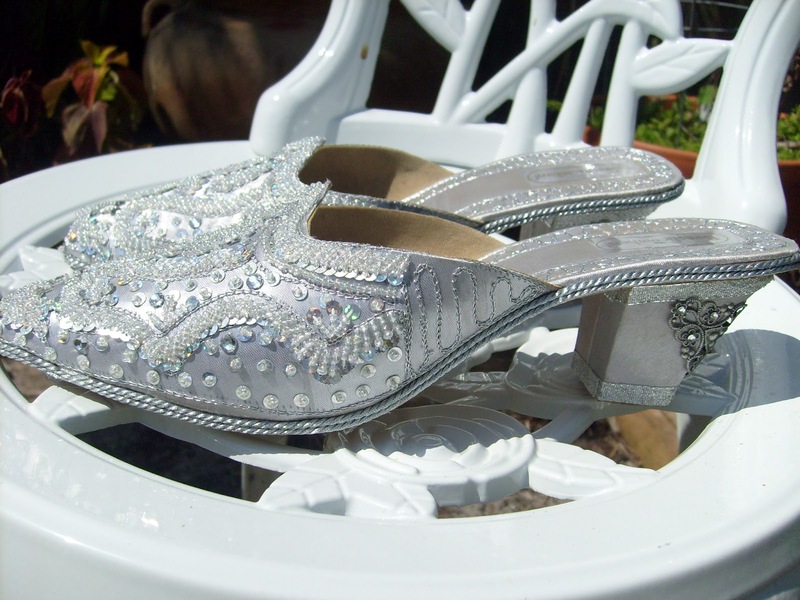 This is how the shoe comes from the company ... they are good, well made, all leather and beautifully covered with lightweight silk, and covered with sequins. They are easy to form to ones own foot, and are comfortable. 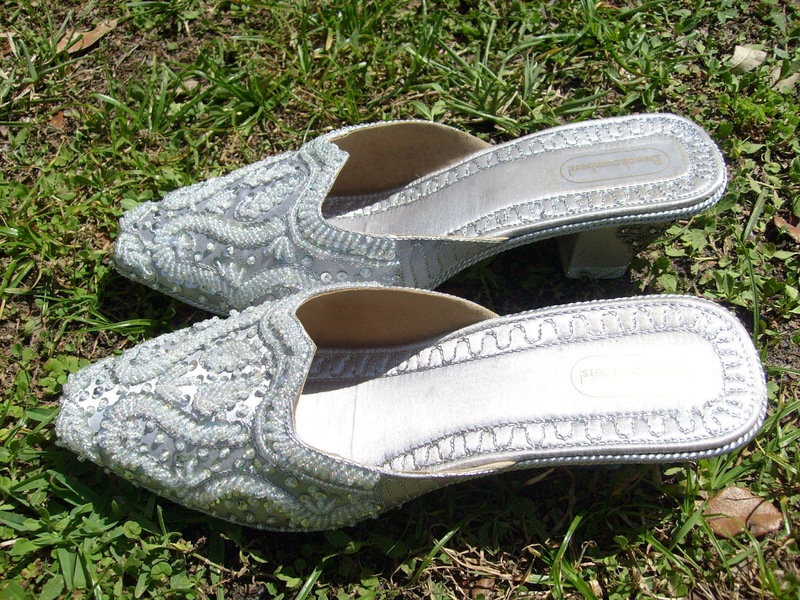 But you can see how they need some additions to make them into a Fairy Tale Slipper. 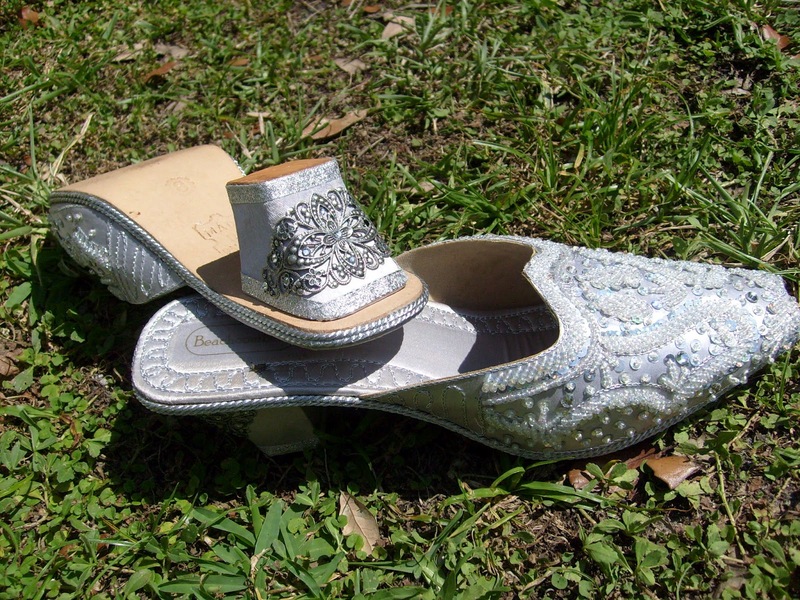 The leather on the side is exposed, though the excellent craftsmanship of sewing can be seen in the stitching and the lines. Also the heel which gratefully is covered with silk also, needs some artwork to make them into a Fairy Tale Slipper. Here is the Slipper finished. 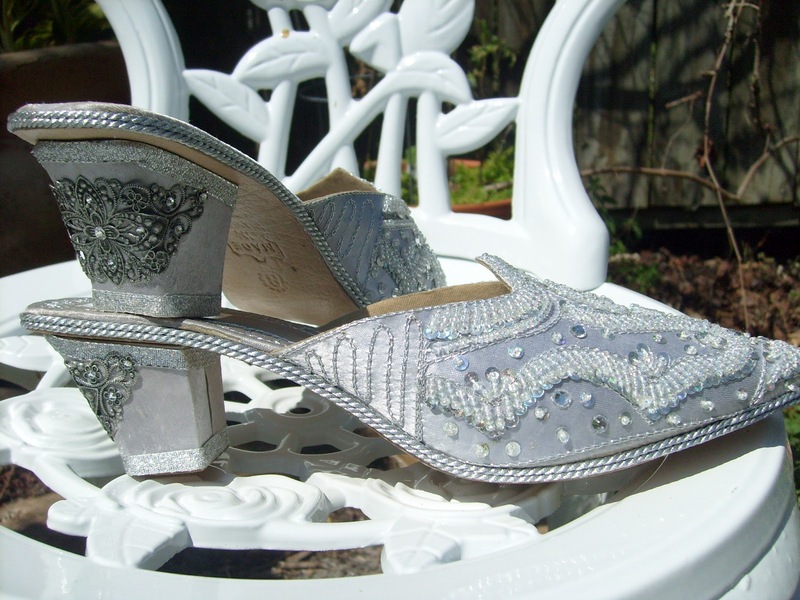 I've added Swarovski crystals and covered the leather with silver corded trim. 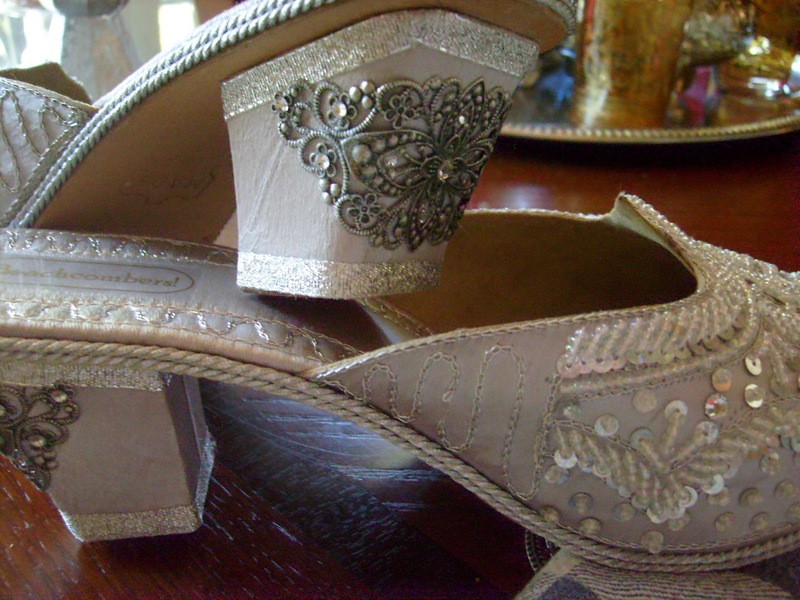 I acquired some beautiful metal filigree artwork, and added some more silver thread trim to the heel. More Swarovski crystals were added because the greatest feature of the Original Slipper is the sparkle which is reminiscent of a ''glass slipper''. 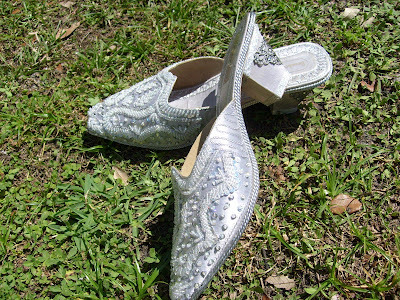 You can see the sparkles of the Swarovski crystals in the filigree work. 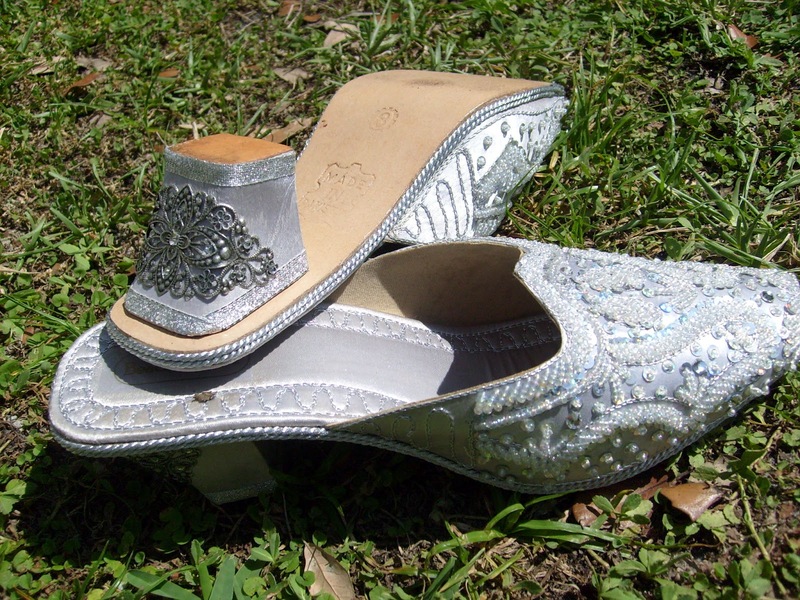 And while these do not have the black beading of the original slipper, this Princess is more than happy with the results. And at the very least, her feet, will live, Happily Ever After. Sweet story--beautiful slippers:) I love the font you use for your blog too. Pretty and easy to read. TFS! Oh my oh my...what a lovely transformation! You MUST actually be the fairy godmother! Transforming everyday things into beautiful objects! Those slippers and the job you did are amazing! 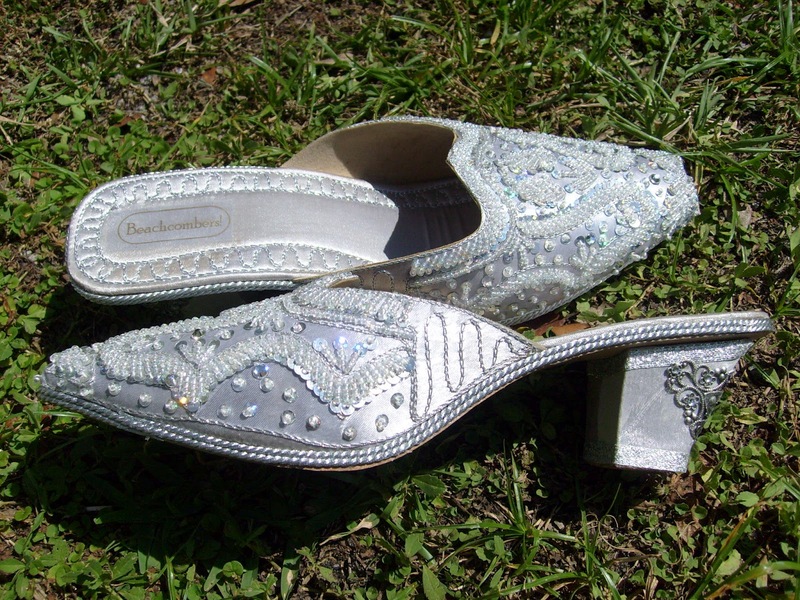 I love Cinderella (actually called her Cinderetta when I was a small child), and I have lived the dream myself. My Prince Charming is my best friend/hubby/lover....and I'm soooo blessed! The dream really can come true! 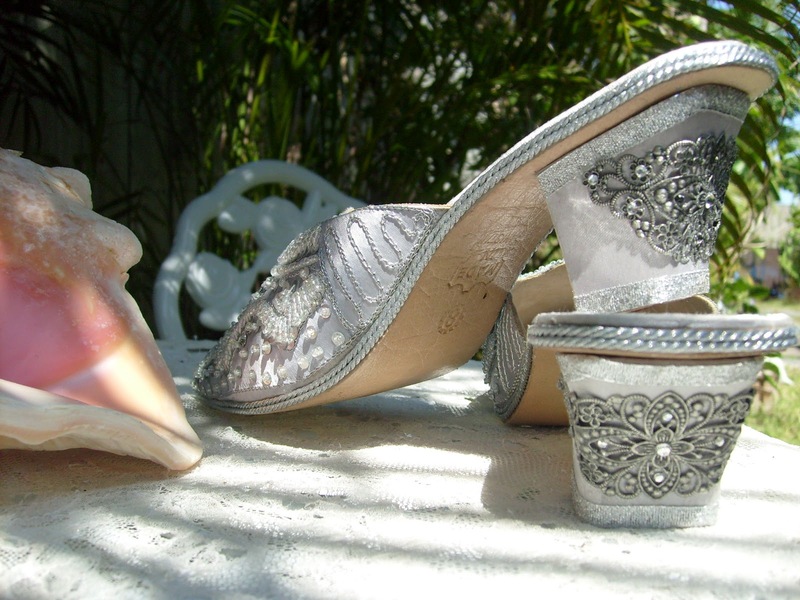 I'm so glad you shared these lovelies with us for Pearls and Lace Thursday...a perfect addition! Browsing your site gave me tingles and chills... very nice magical energy here. Nice!